Orland Park, IL, February 27, 2018 --(PR.com)-- An Illinois based company designed a natural performance enhancing supplement called AminoFitin. The product is intended to facilitate consumer to achieve a healthy weight, and to enhance his vigor, thus helping to build a good looking body. AminoFitin can be used by athletes and anyone who places a priority on staying physically active. 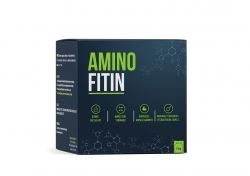 AminoFitin contains two natural compounds - brown seaweed extract and whey protein. Seaweed contains a massive variety of health-promoting components as iron, magnesium, calcium, potassium, zinc, iodine, and more. It also contains vitamins including A, B, C, E, and vitamin K. Brown seaweed is also rich in antioxidants, phytonutrients and fiber, which are required by the body. Preventing obesity, aiding in digestion and detoxifying the body are some of the plant's numerous benefits. Whey protein is one of the two milk proteins, isolated from whey (the liquid part of milk that separates during cheese production). It is widely used in supplements for bodybuilders - it is a kind of "required supplement" for anyone looking to build muscle and get rid of excessive body fat. AminoFitin is company's first product. Manufacturer's current goal is to develop a complete line of wellness products. AminoFitin LLC expects to introduce six more in 2018.